It is not uncommon to not to migrate your website. There can be many reasons for migrations and therefore there are different types of migration. Migration of a site can be a domain migration, host migration, migration from a staging site to a production site, etc. All that depends on why the site is being migrated. Migration of a website can sometimes seem to be a scary task in which a lot can go wrong. It is true that a lot can go wrong when migrating a website but that does not necessarily mean everytime something will go wrong and that you always will need a professional help to do it. When every step of the process is done right, migration of a website is not a big deal. There are certain things that need to be taken care of before, after and during a site migration. There is a lot that can go wrong in a site migration. First things, whatever the migration be, keep a backup of all your data. Because if anything goes wrong, you will have to start everything from scratch, which will be a nightmare and a total waste of time and energy. One of the best things about WordPress is that there are plugins for everything in WordPress. For creating a backup also, you can select a good plugin. There are other ways to create a backup of your website. Many hosting providers give you backup options as a part of their package or you can also create a manual backup of your own. Next, before migrating, take care of the SEO if the site that you are migrating already have a flow of traffic into it. After migration of a site, there is a possibility that you will lose a part of or the entire traffic to your website. Now during migration, you don’t have to do all the migration manually. Since it is WordPress, there are plugins for everything. You can find a lot of plugins that can help you during the migration. What you need to do is find the right plugin that suits your requirements. There are different ways to migrate a WordPress website. You can use a plugin to migrate the website, or you can manually migrate the site. When should be the SEO involved? Involve SEO early on, since it would not be wise to lose any traffic after migration. And involving SEO, later on, will not do any good, but can only help build up that traffic from scratch. What are all the data that you need to migrate? If you are migrating a WordPress site the data that you need to migrate are the database, media files, plugins, and themes. You will need all the files and folders of your WordPress website that start with “wp-“. The database – you can find the name of the database that you need to migrate in the wp-config file. From PHPMyAdmin, you can save export the database in a .sql file. And of course, there are plugins to help you make a copy of your database. There are different scenarios or cases when site migration happens. They are listed below. Sometimes, it can be a combination of these different migrations. When the current website that you are using is not meeting your requirements, or find a better deal elsewhere for your website, you can always change your hosting services. In this situations, you can take your entire websites from one server to another. In the case of WordPress, you need to migrate your database to the new site, then migrate the WordPress files. To move the WordPress database to another website, you need to export the database. Exporting database is a very simple task. You need to go phpMyAdmin application and access your website’s database. Then on the export tab, click on the Go button which will export the database to your local computer. After you have exported the database from the older website, next you need to create and import the WordPress database in the new server. In the next step, you need to make some changes to the wp-config file, and upload all your WordPress files to your new host server. Changing a host server is not as simple as this sounds, and we will be covering in detail how to migrate a WordPress website from one server to another. Migrating a website from one WordPress folder to another can be easily done by the file manager of a particular web host. In such cases, it is better to copy the website files from one folder to another rather than moving them. Once the migration is complete, and you have tested the website to be working fine, then you can remove the website from the older folder. Also, when you are moving from one folder to another, the URL of the website is definitely going to change. So set proper redirections to the website and update the URL in the WordPress site. You can read about updating the URL in the WordPress site under changing the domain section of this article. A lot of websites go through design changes once in a while. Design changes are needed by websites for many reasons. It is important to keep up with the ever-changing design trends. Older looking sites make the users take your website less seriously and give out an impression of a site that is not up to date. Website with modern design makes a long-lasting impression on the users, which is a necessary part of sustaining an online business. Changing the design in WordPress essentially means changing the themes of the website. This sounds like a very easy task. You deactivate the existing theme and install and activate another theme that works better for you. But oftentimes, themes require a lot of customizations to make them look unique and to meet the website’s requirements. Changing the design of a website in the development stage is pretty straight-forward. You can change the design without worrying about the changes affecting anything. But if you have a live website of which you want to change the design, it will not be wise to make the changes directly on the live website, should anything go wrong. In this case, make the changes to the website on a staging site. There is a possibility of things going wrong on the website. The navigation of the site may break, you may lose saved settings of the website, etc. These all invites unnecessary work that can be avoided simply by making the changes first in a staging site. This way the changes made will not affect the live site. This also has an added advantage that the site will not have to appear broken or the under construction for the existing users. There are many different content management systems out there other than WordPress. But when it comes to the percentage of websites using no one comes close to WordPress. There are a lot of websites using other content management systems migrating to WordPress. And there are plenty of reasons for it. The reasons include: it is free, very easy to learn and very easy to use, thousands of free and paid plugins available to do just about anything, you have the ultimate control over everything that happens on your website, huge active support community, constant updates with bug fixes and new features, and more. Out of all the websites that use a CMS, WordPress holds more than 60% of the market share. Its closest rival Joomla holds only 6.3% of the market share. Its closest competitors, Joomla and Drupal, can’t match pace with WordPress and are nowhere near the popular content management system. Migration of a website from a CMS to WordPress can be facilitated using plugins. There are different services that can help you to migrate from a specific CMS to WordPress. But if you want to do the migration yourself, you can take the help of a plugin. There are multiple plugins that will help you in migrating to WordPress. For example, the popular plugins FG Joomla and FG Drupal for migrating from Joomla and Drupal respectively. All you need to do is chose the right plugin. When you are ready to migrate to WordPress, get a new web service provider and install WordPress. Install the required plugin on the WordPress site. The plugin will help you migrate the database and the content of the old website to the new WordPress website. There are some other tasks as well that needs to be done after migrating to WordPress. The look of a WordPress website is determined by WordPress themes. So you need to select, install and activate a theme on your WordPress website. Next, install all the necessary plugins, add widgets, make necessary customization to the theme, etc. If it requires, set proper redirections to the new WordPress site. It may sometime become necessary for you to change the domain of your WordPress website. It can be for reasons like SEO purposes or rebranding of the website etc. Domain migration occurs when you change the website’s main domain or change the subdomains, add or remove subdomains, etc. Changing a domain in WordPress is pretty simple. You can change the URL of the site from the WordPress website admin side or through phpMyAdmin. 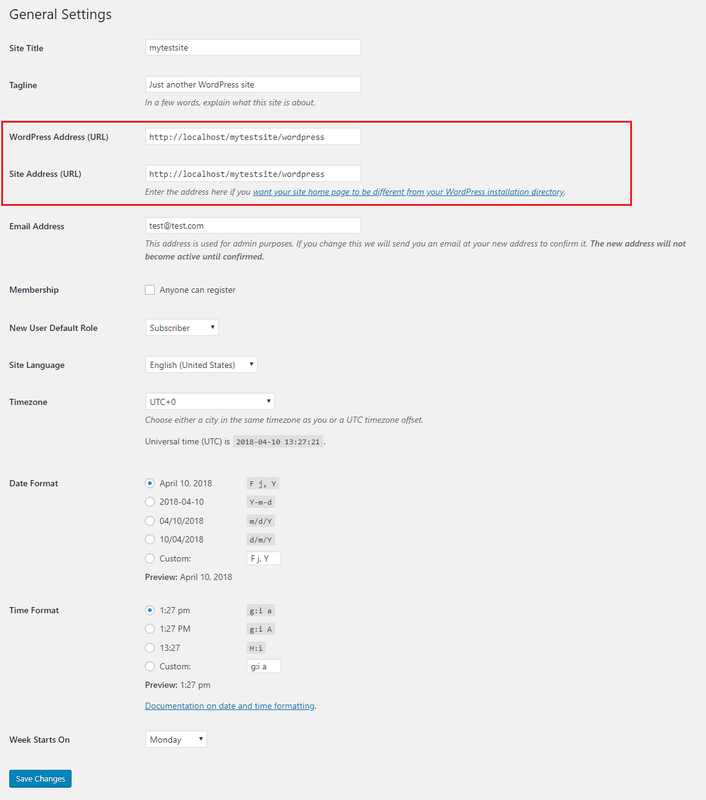 From the WordPress dashboard go to Setting > General. From this page, you can change the WordPress address and the site address. The tricky part is setting up proper redirections after changing the URLs. If your site previously had some flow of traffic to it, you will lose all that traffic when you change the domain. So, if you want to keep all the traffic on the website intact, what you should is set proper redirections. If you don’t set up proper URL redirections, this will cause a significant drop in traffic and thus in the revenue that the website generates. You will have to start everything all over again. Setting up redirection of WordPress can be done by the right plugins. There are a lot of redirection plugins that can help you redirect your pages with simple steps. Content is an important part of the website. It is a defining part of the personality of the website. So, depending on the content of the website, it can be attracting, engaging and provide value to the users. The contents of the website include the blog posts of the website, the description of your products and services, and also includes images and videos. When migrating the content of a web, you are only migrating a part of the website. You don’t have to worry about the design and other parts of the website. The rule of the thumb is that you keep a backup of the data. Moving the content from one WordPress website to another can be easily achieved by exporting and content from the source website to the destination website. For this, you don’t have to go search for anywhere else. WordPress has the features to export and import posts in-built. 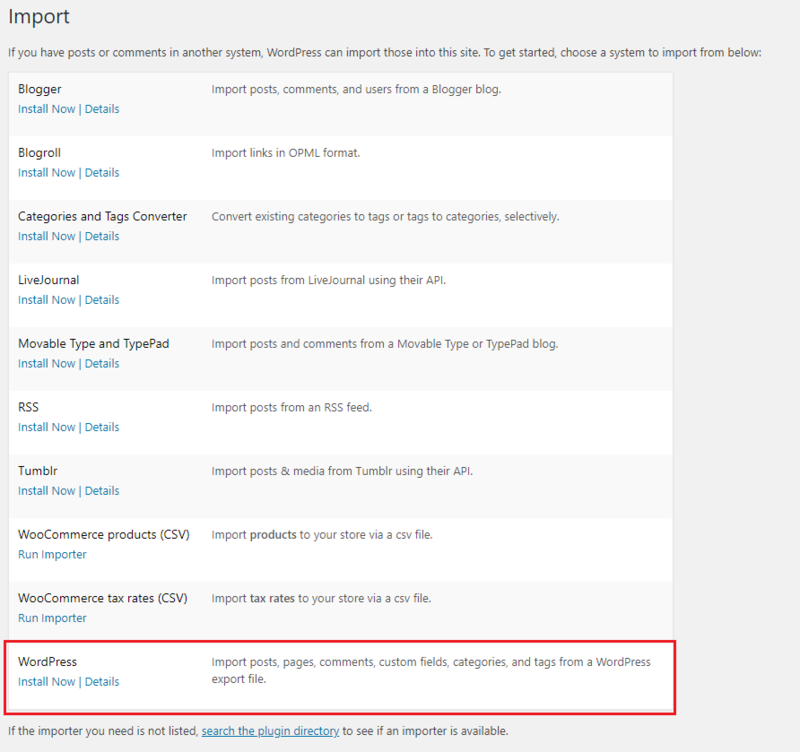 To export and import posts from WordPress go to Tools > Export. From this page, you can export posts in WordPress website in an XML file. You can choose to import all the post or only a specific type of post from the WordPress site. While exporting posts and pages, WordPress allows you to export posts that come under a particular category or written by a specific author. After selecting which post to export, click on Download Export File. This will download an XML file on your local computer. Now, after exporting the posts, head to the destination site where you want these exported posts. From the WordPress dashboard, go to Tools > Import. From the import page, you can see a list of systems from which you can import post to your site. 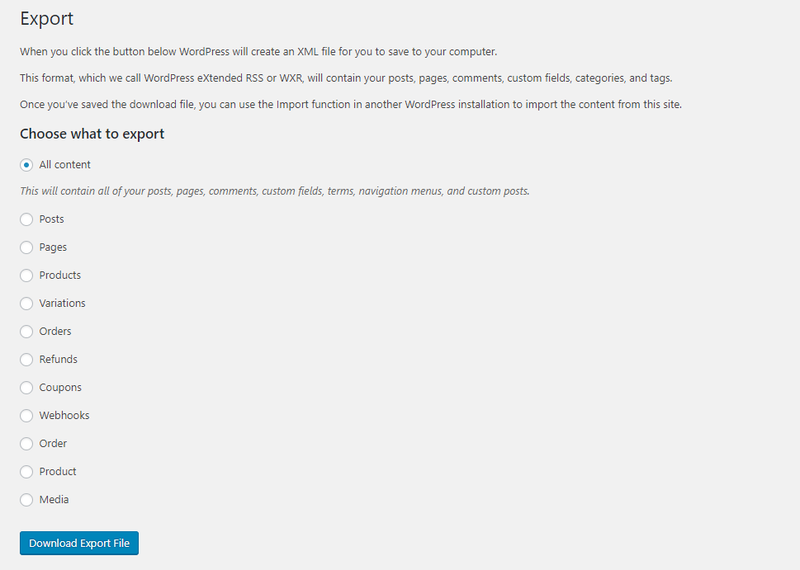 Since we are importing WordPress posts, what we need is the WordPress installer. At the end of the list, click on Install Now. After installing, click on Run Importer. This will take you to the Import WordPress page. From this page, click on the Choose File and locate the exported XML file. And then click Upload File and import. This will import all the contents of the XML file to the new WordPress site. Migrating a WooCommerce store requires migrating data like products, customers, orders, coupons, and other data. Rest, migrating a WooCommerce store is pretty much like migrating any other WordPress website. WooCommerce data are a type of ‘post’. The data are stored in the database table wp_posts as different post types and the metadata of the products in wp_postmetadata. So migrating the products, orders, coupons are same as migrating posts. You can migrate the data from one store to another by exporting them into a CSV file from the origin site, and then import them in the destination site. This can be easily achieved by installing the right set of plugins on both the sites. When migrating products of a WooCommerce product, an important part is importing the products images and linking the images with the products. Images can be migrated from a WooCommerce store to another via the product CSV file. There are two ways in which images from a WooCommerce store can be migrated to another store. One way to do this is to upload all the images to the media library. In this case, the CSV file should contain the name of the image. Then the image will be associated with the corresponding product. The next method is to give the URL of the image in the CSV. So during the import, the images will be fetched from that URL. If you want to learn more about Migrating a WooCommerce website, you can refer the articles Migrating WooCommerce Store Data to a Newly Developing WooCommerce Site and Migrating WooCommerce Data to an Existing WooCommerce Store. This article summarises different types of WordPress site Migrations. Explaining each type of migration in detail is beyond the scope of this article. All these types of migrations will be explained in the upcoming articles.